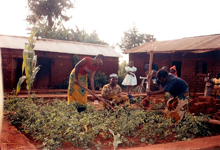 The Mtitu Foundation is a small voluntary organisation set up to raise funds for the poverty-stricken village of Mtitu in Tanzania, East Africa. Since we were established in 2006 we have raised over £30,000 for projects in Mtitu, and some of our successes have been to contribute towards clean water pumps, a clinic for the village and a secondary school. A small amount of money raised in the UK goes a long way in Mtitu! Please explore our website or follow us on facebook to find out more about Mtitu and how you can help to make a difference!